I have mentioned before that I have taken a couple of Craftsy classes, well I have signed up for another one. It is Entrelac Knitting with Gwen Bortner. 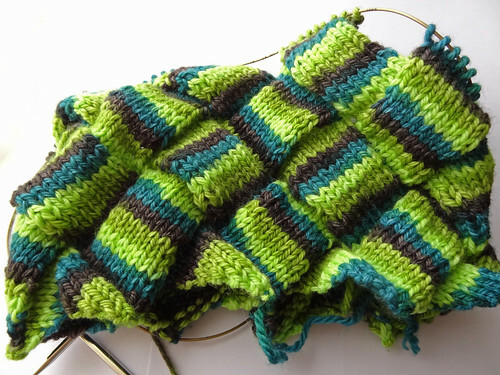 Entrelac knitting has been on my "must learn" list for a couple of years now, in fact it was mentioned in Knit and Crochet Blog Week in 2011 as part of my "Something to Aspire To" entry. When the course came up I read a few reviews and looked at the patterns that were included and thought they looked interesting and that I would enjoy working my way through the course. Then I was offered a discount and I leapt at it. I'm now working my way through the first section of the course, the Infinity Neck Warmer. This is knit in the round and I had the perfect yarn for the project. BabyLongLegs British Merino Aran. This stuff is unbelievably soft and squishy. I think it is impossible to get now as it was a limited run yarn base. As always BabyLongLegs has created something stunningly bright and fabulous. 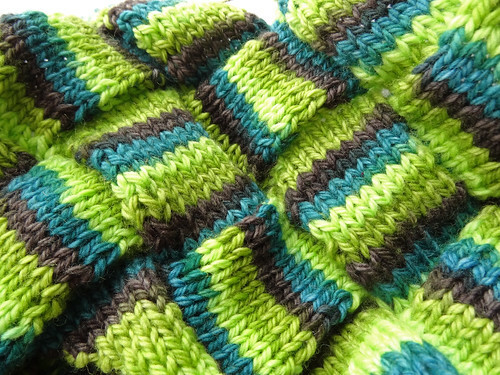 The entrelac pattern and this yarn are working fabulously together. I love the little striped boxes that are being created in each round. I think the pick up and purl and pick up and knit that you do, depending on the direction of the round, make a very neat border between each unit. I'm on my last round before I finish off with a round of triangles at the top of the cowl. I can't wait to get it finished and blocked. I am definitely keeping this as I don't actually own any cowls. This could be the start of a new passion for both entrelac and cowls! The second project I started this week is a very small one. Well the bit I did was small. Yes, I have finally caved into the craze that has swept the whole of blogland. I have started Hexipuffing. I bought the Beekeeper's Quilt pattern by Tiny Owl Knits and started to read through it. I then realised that I wanted to knit these little beauties on DPNs as I felt that magic looping something this small would drive me insane. I don't have any DPNs because I always magic loop, so I splashed out on some Brittany 3mm DPNs from p2tog. The pattern recommends using 3.5mm needles, but I have really a loose gauge, so I knew I needed to come down a couple of sizes. Now I have the needles, which came really quickly, I am glad I went for this particular size. 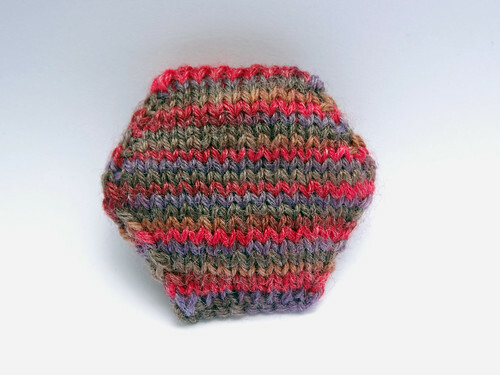 The fabric of the hexipuff is perfect. I've only lightly stuffed this little hexagon because I want the finished quilt to be quite flat, and light. Also, I think with less stuffing, the fabric will spread out more, so less puffs will be needed. If you've never seen the Beekeeper's Quilt, Tiny Owl Knits has some lovely photos on the pattern page, on her blog. I have got together a bag of things to be able to whip out a puff whenever the mood strikes. 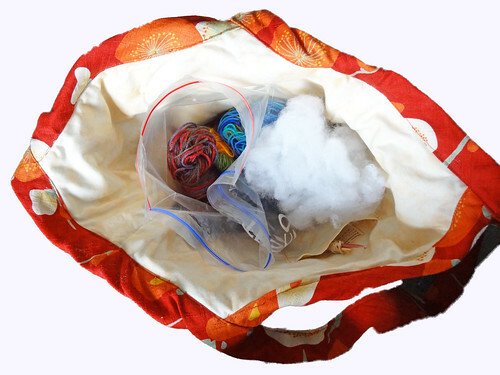 I have the needles and a crochet hook in the side pocket, and I'll get my snips out later and add them to the bag. I have some stuffing, and what I've put in the bag will last for quite a few hexipuffs. I've also grabbed a plastic bag full of part skeins of sock yarn. I have quite a lot of part skeins of sock yarn because it seems to be my favourite weight at the moment. I have some lovely yarn just sitting in a plastic bag waiting to be used. 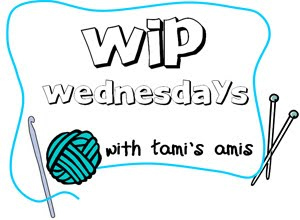 This project finally got under my skin when I saw a couple of my Leicester Merry Makers friends working on their puffs and talked about swapping yarn for their hexipuffs. Seeing these little components in the flesh really made me want to make some. The photos never convey the cuteness. My friends at the Merry Makers have some cracking sock yarn. Can't wait to get swapping! Click on the button to see other works in progress.